Unneeded iPhone, iPad, iPod touch, I am asking for a kind donation. I use a great number of devices to carry out a work. 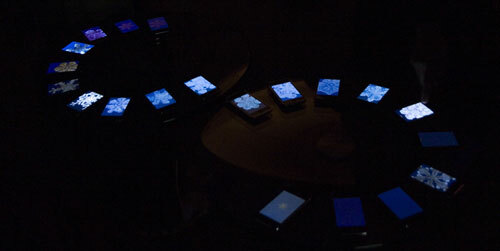 Formerly I used 50 iMac for a work called incubator (1995) and, in the recent years I use 20 to 50 iphones for a work called Snowflakes (from 2008) and Okeanos Buoys (from 2010) etc. A great number of devices making a cooperative movement, autonomous decentralized environment kind of expression is what I have interest in, that’s why. If possible, I would like to use dozens or hundreds or even thousands of devices to create a work. However, the purchase of such a great number of devices is economically difficult. On the other hand, the change of models or devices that are not used anymore exist in private households or in companies, I think. In that case, if the devices became unnecessary, I would ask you to donate them. The donated devices will be used with great care, from now on one part of the performances practical use. This reminds us to think the present state that many new models come out on the market every year and the effective use of our environment and resources. Also, on this website, the name of the donor will be mentioned, as a mark of gratitude. For the purpose of an even bigger realized work and a practical usage of our resources, I ask your kind help. – Please donate unneeded iPhone, iPad, iPod touch. – The SIM of iPhone or iPad 3G is not needed. – Minor damages are no problem, but fully working items are wished for. – The original package, cables or any other additional equipment that came with the device, are also not needed. – If the donator has no description, the original name will be introduced. – Please send the device to the address written below. If you have any question, please use this inquiry form. Mr. Hiroaki Ishiura, Ms. Hyojung Seo, Mr. Junji Ikeda, Mr. Takeshi Fukushima aka takecha, Mr. Itsuo Sakane, Mr. Masayuki Nii, Mr. Keisuke Tanaka, IDAS students (Green Growth), Mr. Yuya Ito, Mr. Yoshiyuki Hino, Ms. Tomoko Miyagawa, Mr. Motoi Shimizu and many anonymous donators.